Sometimes we need to calculate something outside the standard LCA equations. In this blog post, I will show you how I recently did three such calculations using Brightway. There is an accompanying notebook which provides complete code examples. At PSI, we work a lot on energy production and consumption, and supply lots of electricity and mobility datasets to ecoinvent. A natural question for us is therefore just how important (in terms of share of environmental impact) our datasets are. This is a bit tricky to calculate, as we want to estimate the cumulative impact of electricity everywhere it is supplied in the supply chain. You could try manually traversing the supply chain, calculating the impact of an electricity input each time it was encountered, but that sounds long and tiresome. 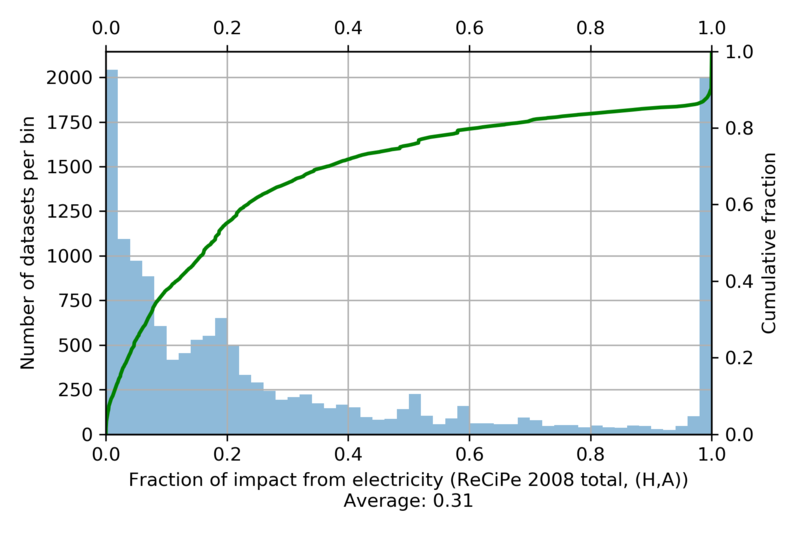 Instead, we can be clever and compare the impact of an activity with and without any electricity in the system - the difference is the fraction of the impact that comes from electricity consumption. Instead of zeroing out each electricity input by hand in the technosphere matrix, but we can skip some work by building on top of the Wurst framework, which has a number of built-in manipulation functions. The key is the create a copy of ecoinvent, zero out the electricity inputs for each activity, and then... well, then you are done! 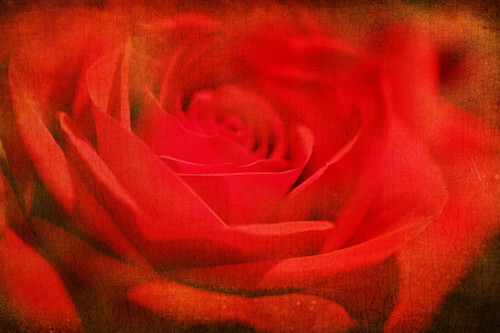 When working with ecoinvent, you should expect the unexpected. Our initial guess is that electricity inputs will have the unit "kilowatt hour", but we need to check this - and we need to check to make sure that there aren't any electricity inputs with have a different energetic unit. We do both these checks manually in the accompanying notebook. 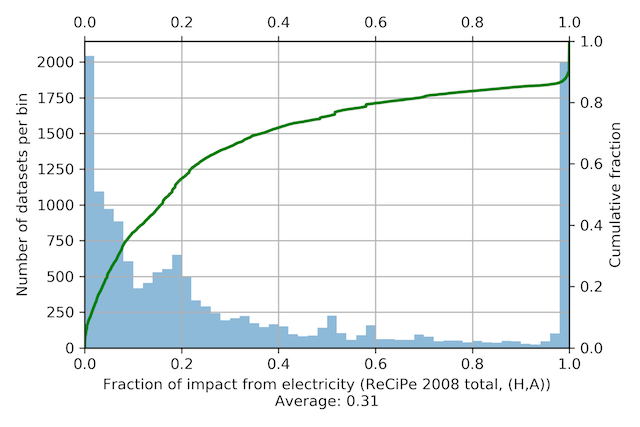 Due to our recent speedups, it is quite reasonable to calculate LCIA scores for all activities in ecoinvent 3.4 (something like three minutes, depending on your computer); when we compare the scores of the original and the modified database, we see that electricity accounts for 31 percent of total impact on average for the ReCiPe total indicator (2008, hierarchist perspective). This works fine for individual calculations, but won't scale gracefully to many calculations. To do meta-analysis and be web scale, we need to do some work ahead of time, and construct mask arrays for each possible location. This works for multiple activities because of the way that matrices are built in Brightway - we have a guarantee that rows and columns will be built in the same order each time. 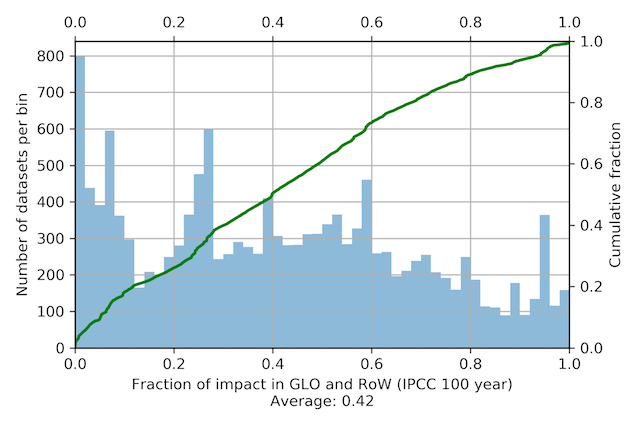 We can use these results to see what fraction of impact occurs in global or "rest of the world" datasets. 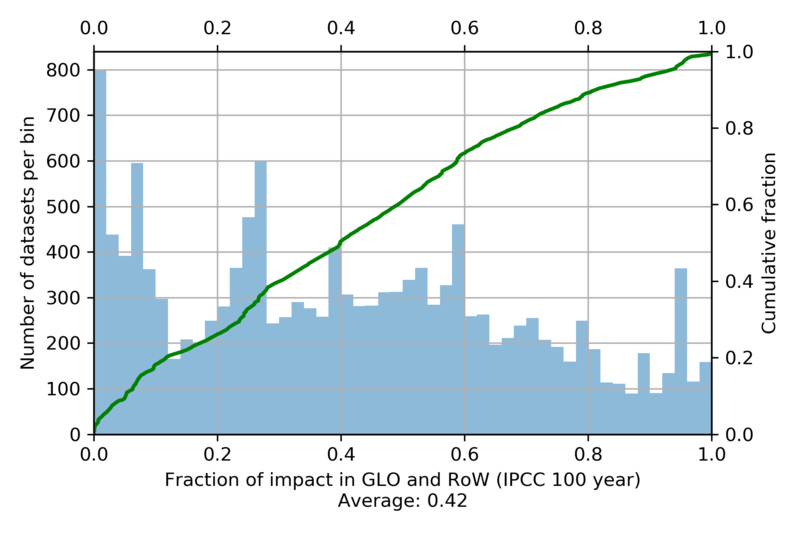 Note that, in contrast to the previous example, we don't trace the impact of each activity occurring in GLO or RoW throughout its supply chain, but instead are just adding up the direct emissions of each supply chain activity that occurs in GLO or RoW. I think it is quite interesting how flat the CDF line is; I don't have an explanation for this behaviour. In this example, we ignored the difference between different forms of freight transport, and just added all "ton kilometers" together - in a scientific paper, the different modal forms of freight transport should obviously be split.